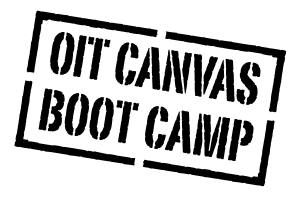 With the success of our Canvas Boot Camp this summer, we will be offering them again in time for the Spring Semester on Wednesday, January 18th and Thursday, January 19th. We hope you’ll join us for these come-and-go learning opportunities to get you up and running on Canvas. Registration for the Boot Camp is not required, but the sessions are offered on a first-come, first-served basis. Please see the class descriptions section below for more information on these Boot Camp workshops. Learn the basics of the Canvas user interface, how to log in, understand notification and communication options. Examine how to use WalkMe tutorials and WalkThru(s). Learn why modules are one of the best and most popular ways to design a Canvas course. This workshop is designed to show you how and when to create quizzes in Canvas. Learn about the new Respondus lock down browser. In this session, we will cover assignment creation, student submissions, instructor grading, rubrics, Speed Grader and more. Join us as we show you a fast and simple way to get your course up and running. You will see examples of how courses are built in Canvas. *Completion of the Intro to Canvas course should be completed prior to attending.